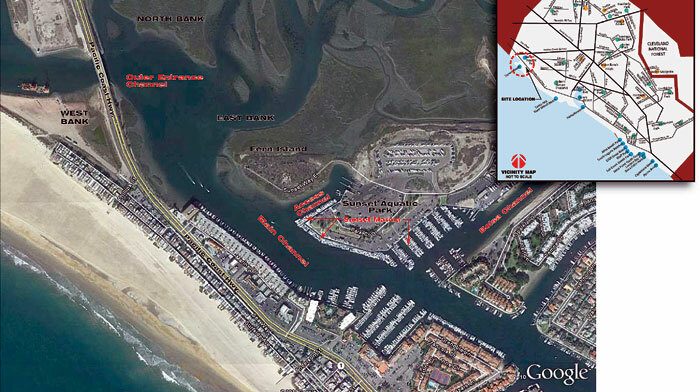 HUNTINGTON BEACH – The Orange County Board of Supervisors has selected architecture and engineering firm Moffat and Nichol to begin planning the first maintenance dredging in Huntington Harbour since 2001. The Sunset Harbor Maintenance Dredging project, which was voted upon at the Board’s Oct. 2 meeting, is expected to remove approximately 80,000 to 100,000 cubic yards of sediment from the harbor, bringing multiple areas back to their original design depths. Boaters with slips at the county-run Sunset Harbor Marina facilities will benefit from the dredging project, which is needed because of silting from the Bolsa Flood Control Channel and from landside runoff that has accumulated over the past decade. The project is expected to cost around $2.5 million for planning and execution, according to Orange County senior coastal engineer Susan Brodeur, with dredging expected to begin in Spring 2014. The project includes bringing five areas back to original Mean Lower Low Water (MLLW) design depths, including the entrance channel near the Coast Highway bridge (to 12 feet MLLW), the main channel along Mariner Drive (to 10 feet), the access channel adjacent to the launch ramp (to 8 feet), Sunset Harbor Marina (to 9 feet) and the Bolsa Channel (to 15 feet). Prior to dredging, sediment quality testing must be conducted to determine where best to dispose of the dredge material. It could potentially be used for beach replenishment projects if the sediment is the right grain size. If not, it may be transported to the offshore LA-2 sediment disposal area. Any sediment found to be contaminated or polluted must be disposed of at an approved inland landfill. Moffat and Nichol will be required to provide the dredging plan and the associated environmental documentation and regulatory permits required for the project. The county issued a Request for Proposal (RFP) in June that was distributed for design and consulting firms to submit their interest for the Sunset Harbor Maintenance Dredging Project. Nearly 100 firms viewed the RFP, and five proposals were received and evaluated based on pre-established criteria. An evaluation panel consisting of staff members from OC Parks, OC Public Works, and the city of Newport Beach rated the firms on their written proposals. The panel recommended Moffat and Nichol for the project. Moffat and Nichol formed in 1945 and is based in Long Beach, operating throughout North America, Europe, Latin America and the Pacific Rim.